The best navigators and shipbuilders of the ancient world in 1500 – 1000 years B. C. were Phoenicians who lived on the Eastern coast of the Mediterranean Sea. The famous Libyan cedar, which covered slopes of their motherland, gave an excellent material for building of strong seafaring ships. 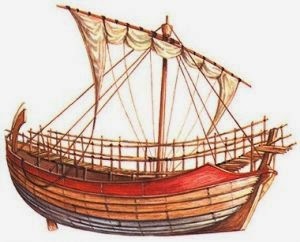 The picture depicts a Phoenician merchant ship dated 1500 year B. C. This was a sufficiently capacious vessel with powerful posts and two stern oars. Twig gratings were strengthened along the boards of the ship to protect the deck cargo. The mast carried a square sail fastened to two curved yards of an Egyptian type. A large amphora made of burnt clay was erected on the stem to keep drinkable water. Phoenician helmsmen contributed to the navy science introducing separation of a horizon circle into 360 degrees and they composed reliable celestial reference-points for future generations of seafarers. This entry was posted in Ancient Trader by MSW. Bookmark the permalink.